In my mind, the most sensational and odd fashion event of 2012 was rebranding of Yves Saint Laurent to Saint Laurent Paris. Responding to flurry of complaints, newly appointed creative director Hedi Slimane claimed he was resurrecting the original brand...In his debut collection in September 2012, Slimane put on a classic YSL tuxedo on American cowgirl, which was hardly innovative. 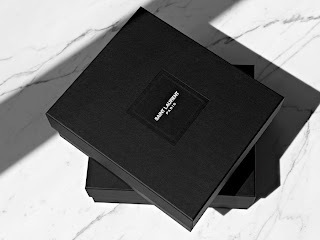 Today, as I check out ysl.com I no longer see iconic pieces such as Tribute platforms or Belle du Jour clutch. Instead I'm presented with the new accessories range. My initial reaction to the rebrading was borderline anger and total confusion. As an owner of classic YSL pieces, i'm annoyed with YSL logo becoming obsolete. I read that Slimane wants to be contemporary and appeal to the younger audience. There is a way to introduce novelty without killing the established brand and its classic range. Rebranding was a bold move, but not all bold moves are smart. We'll see how well this strategy plays out in 2013 and if it translates to increase in sales. I will be holding on to my YSL classics and certainly am NOT in a hurry to snag the new It Bag in town.